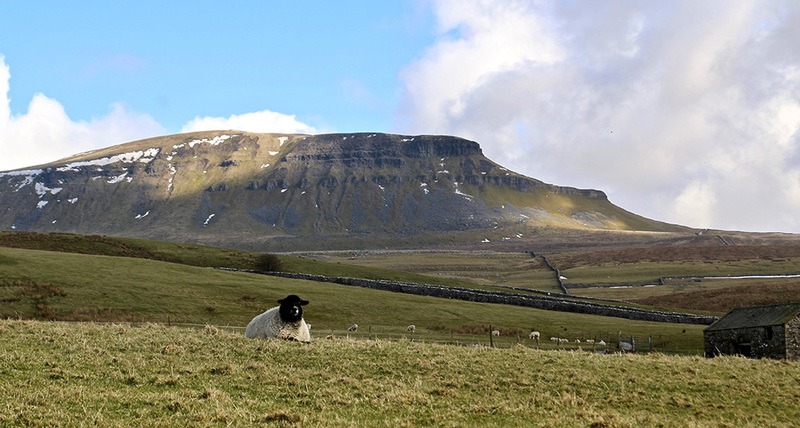 Ahh, spring in Upper Ribblesdale. 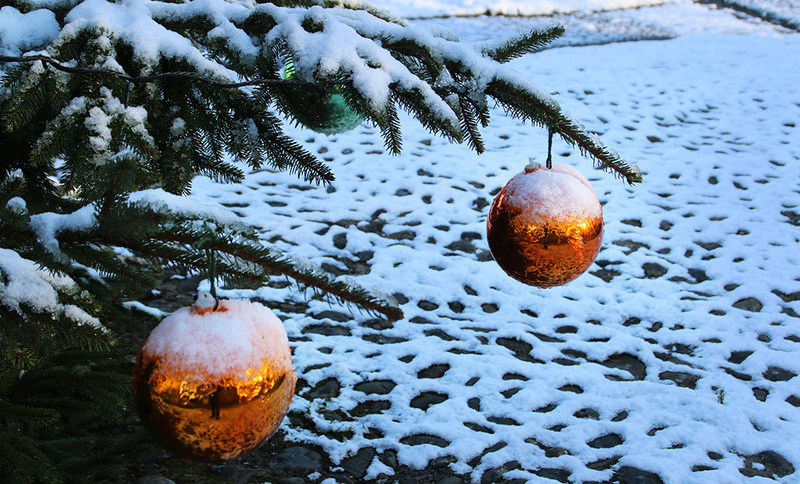 As I write, snow flakes are doing a drunken dance, not knowing which direction to take next. 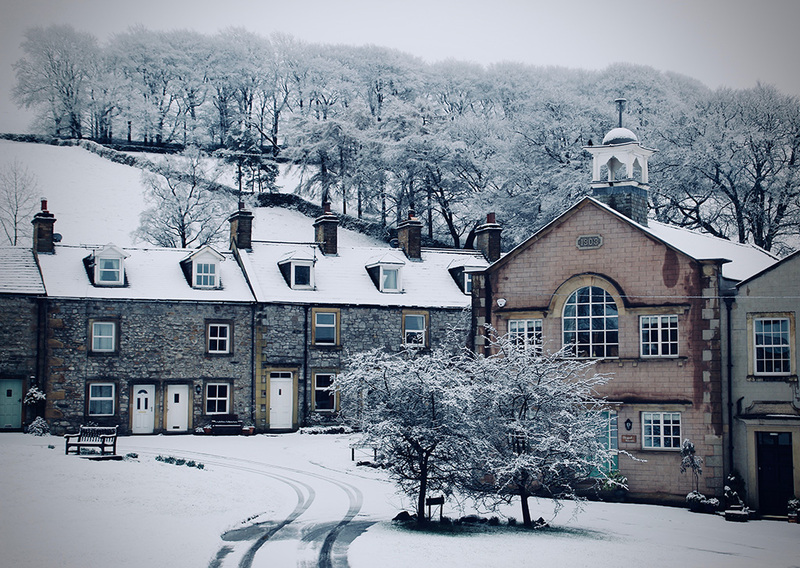 The village looks like a Christmas card, and I have to conjure up a vision of the surrounding hills because they’re shrouded in cloud, or should that be clouded in shroud. Let my photo diary record that this is all the fault of the Russians. They seem to be getting the blame for everything at this moment in history, so why not the weather? I’d best not go all political here. I was around when Russia got it the neck during the Cold War, today I have a war against cold around my neck. 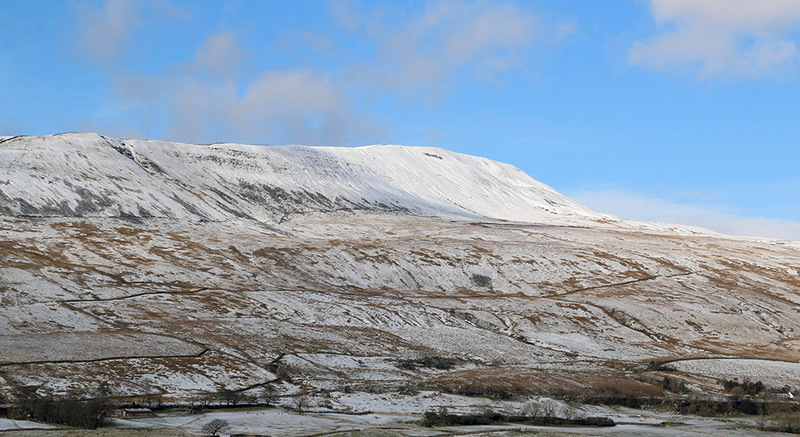 Top photo shows Penyghent just before the latest snow Ribblesdale. 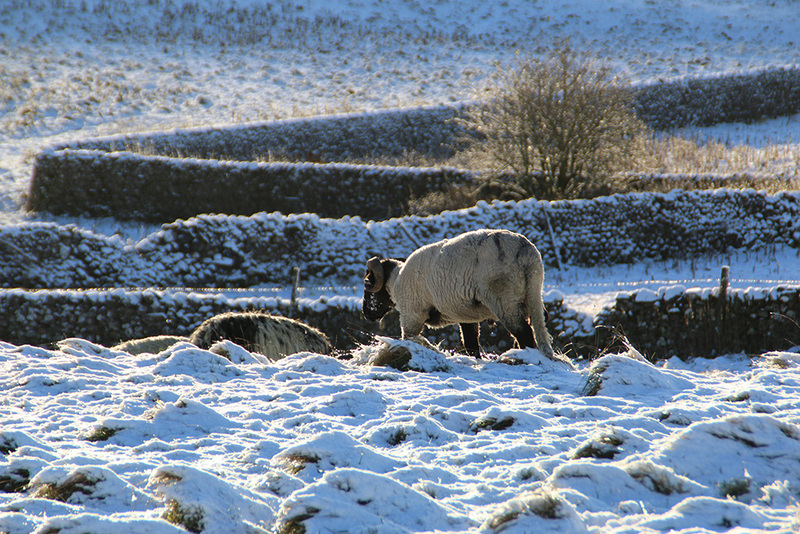 I watched some new-born lambs looking distinctly miserable in temperatures that with added wind-chill dipped as low as -12 in Ribblesdale this week. 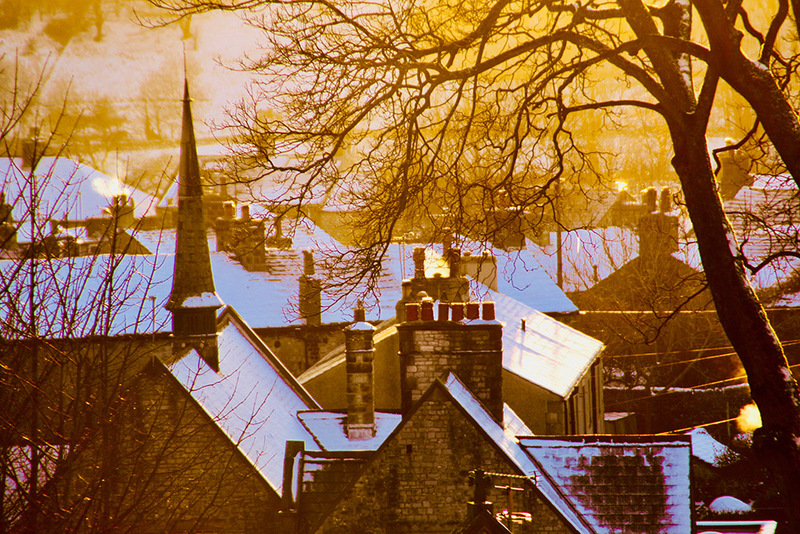 Langcliffe: rooftops at sunset, and the village ‘green’. The bathroom needs a lick of paint. Unenthusiastically, I dug out a half-full tin of emulsion and a brush from the cupboard under the stairs. Of course, everything had to be removed from the abyss before I found said items at the back. I took them to the bathroom, wondering if I formally introduced them to the walls, would they strike up an instant rapport and just get on with the job themselves. As I turned to fetch a dust-sheet, sunshine burst through the bathroom window. 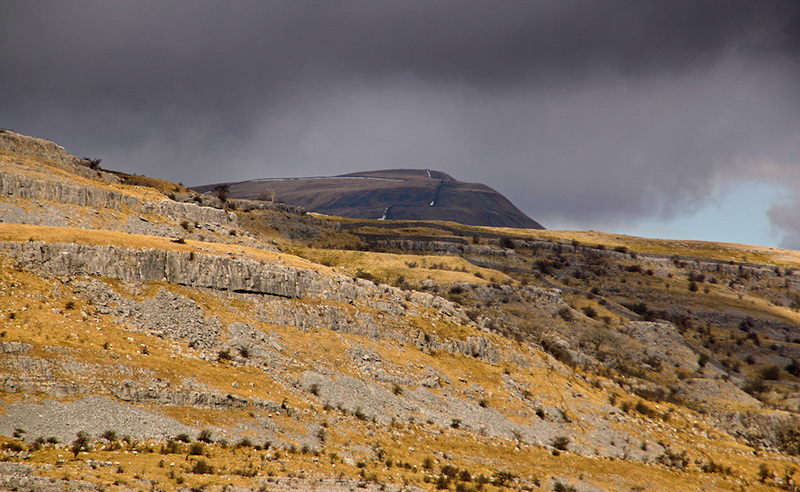 Within minutes I was driving up Ribblesdale, camera by my side. The tin of paint and brush are still on the bathroom floor, walls remain unpainted. I’m presuming they didn’t form any kind of relationship. Perhaps they just need a little more time to get to know each other better. 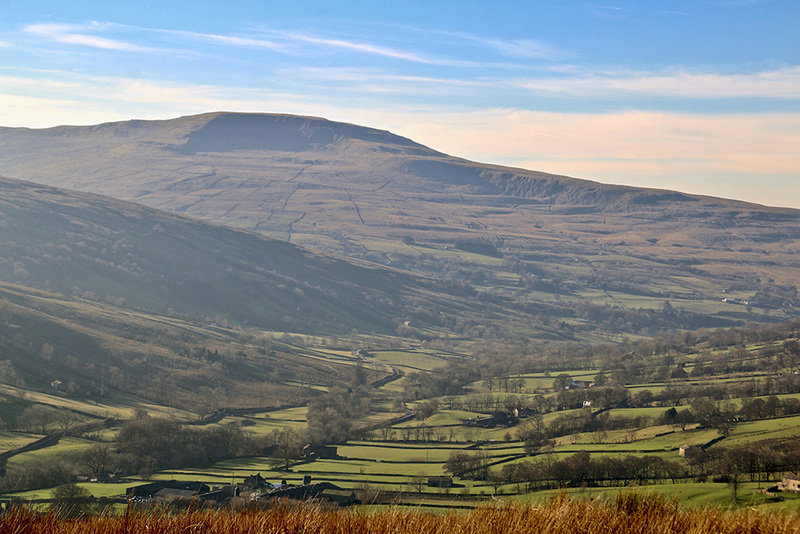 A different angle on Whernside from Chapel-le-Dale. 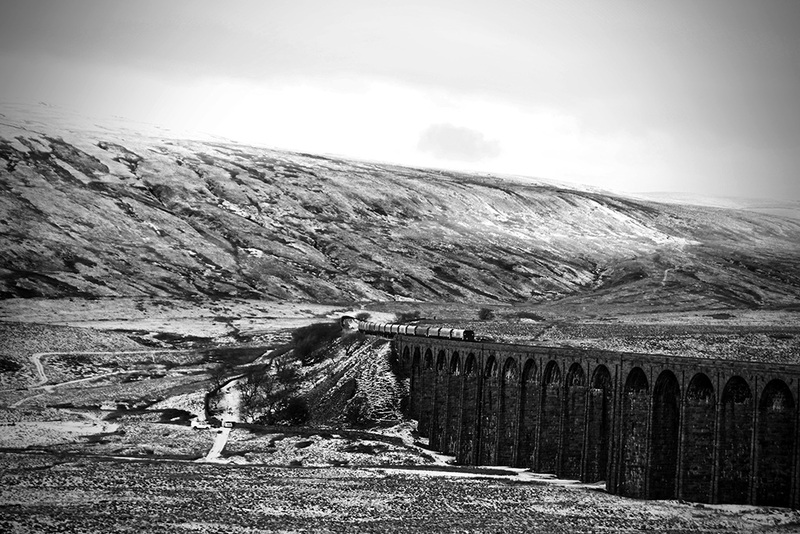 In my youth I followed that wall up to the top from Ingleton. What a slog. Thankfully, never again. I can’t imagine what hell the wall builders went through. 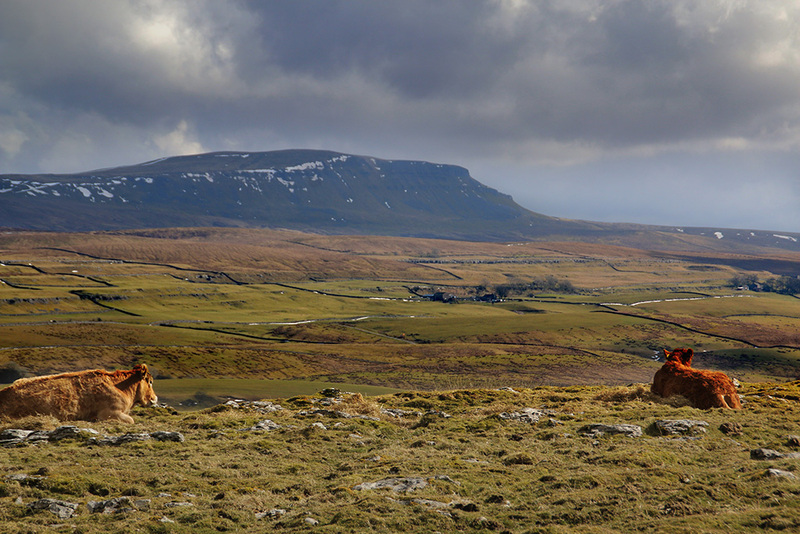 Badly cropped photo of cows looking over Ribblesdale early in the week. 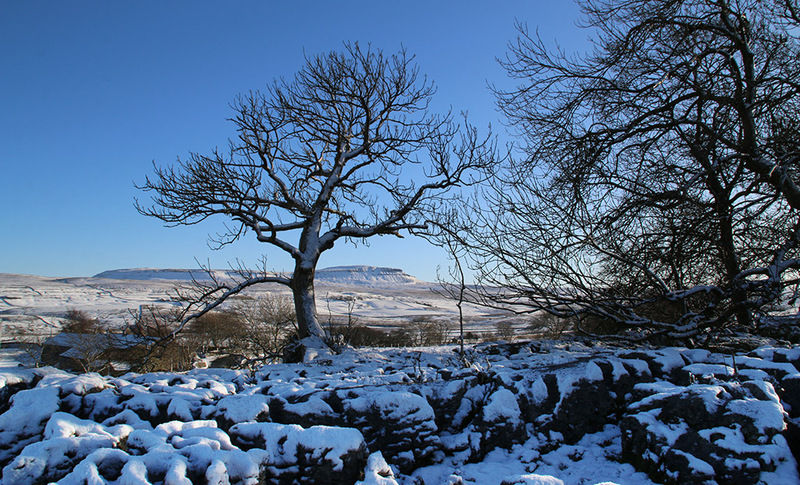 Above, and two following photos, a tree theme – early spring in Ribblesdale between Horton and Helwith Bridge. 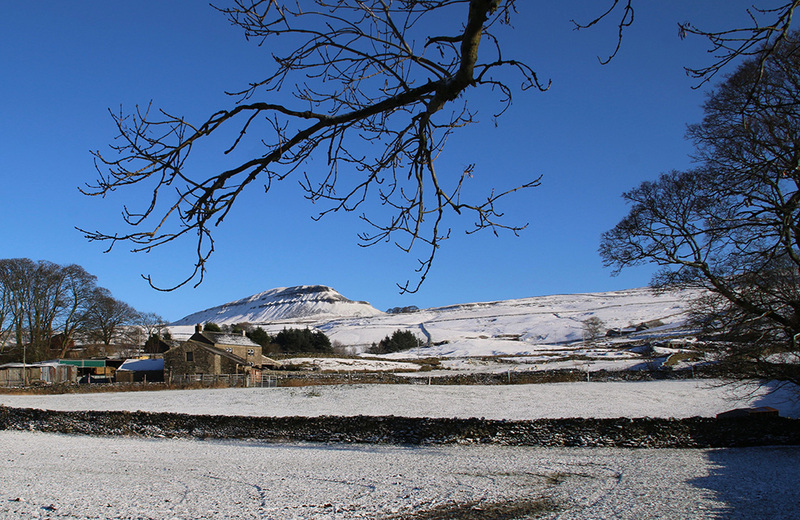 Happy Christmas from the Yorkshire Dales. 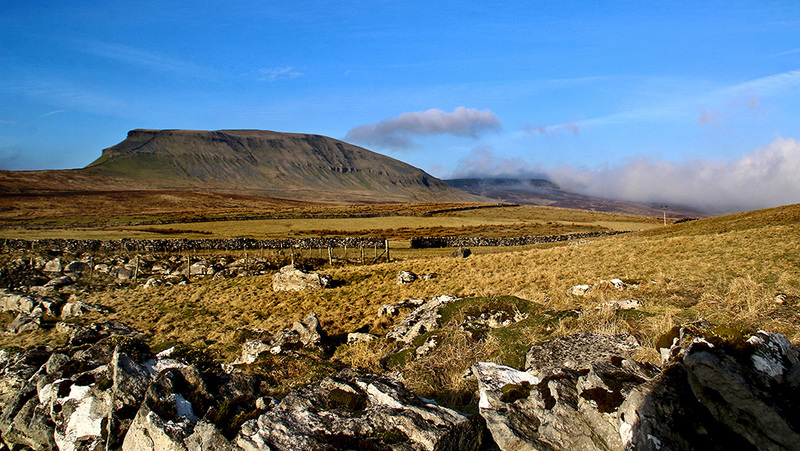 It’s not been a good week for photography with there being so much fog around here in Ribblesdale. Add that to my annual catch-ups with old friends, visiting family and having a stinking cold means my photographic output has been practically zilch. 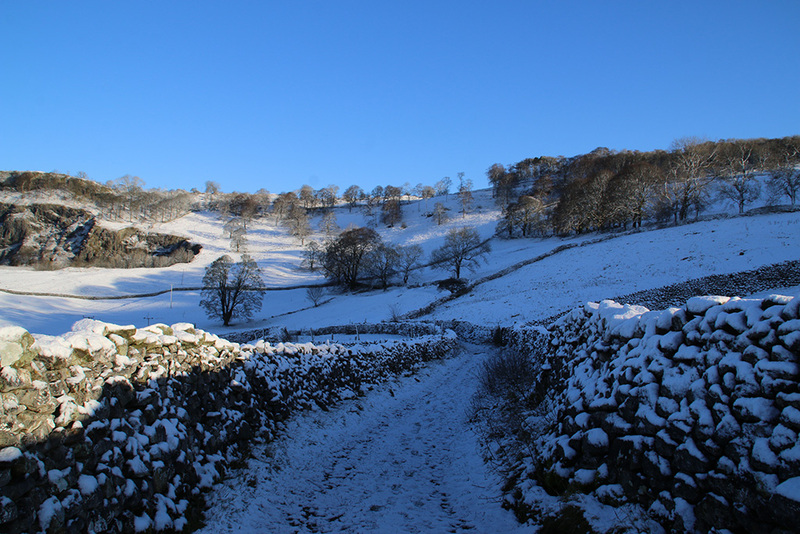 It has, however, given me chance to search through this year’s archives and pick out a few Christmas and wintry scenes featuring the Three Peaks area and further afield in the Dales. 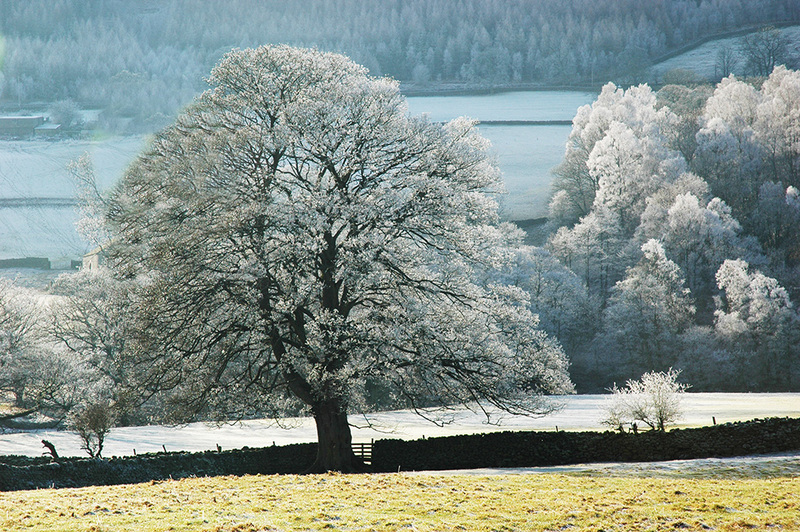 The top picture and this one of frosty trees were both taken in Wharefdale, near Appletreewick. 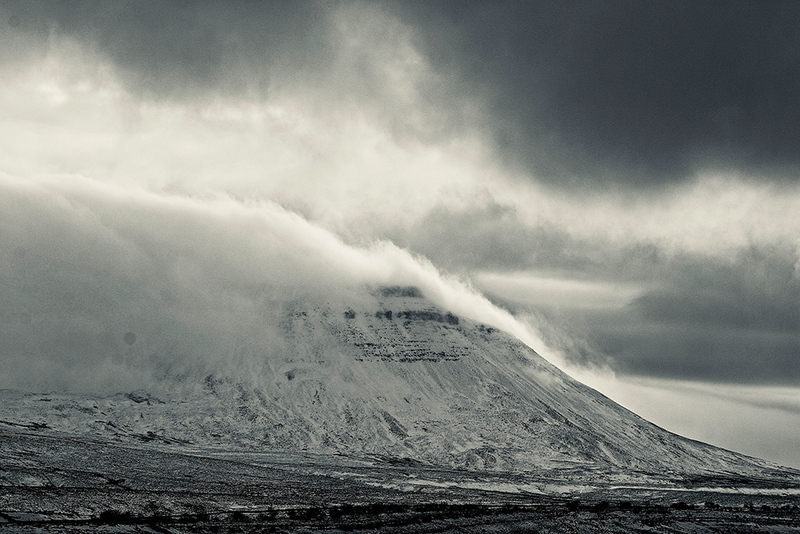 These shots of Ingleborough are not in black and white. 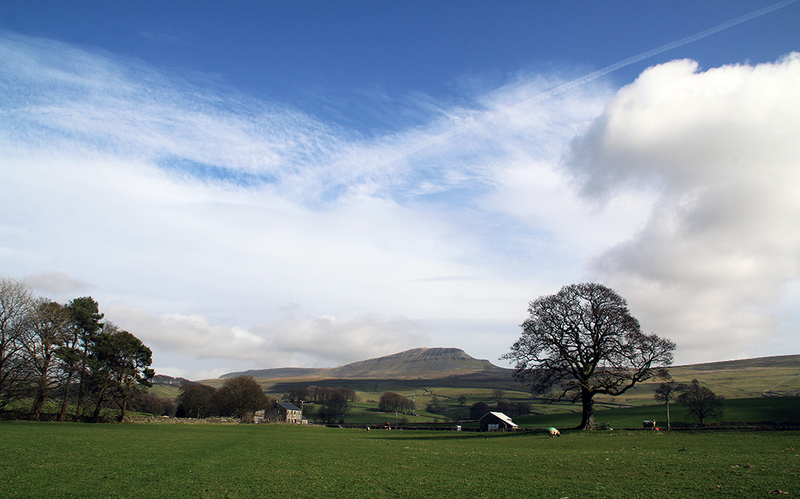 A chilly dales day with swiftly moving clouds. 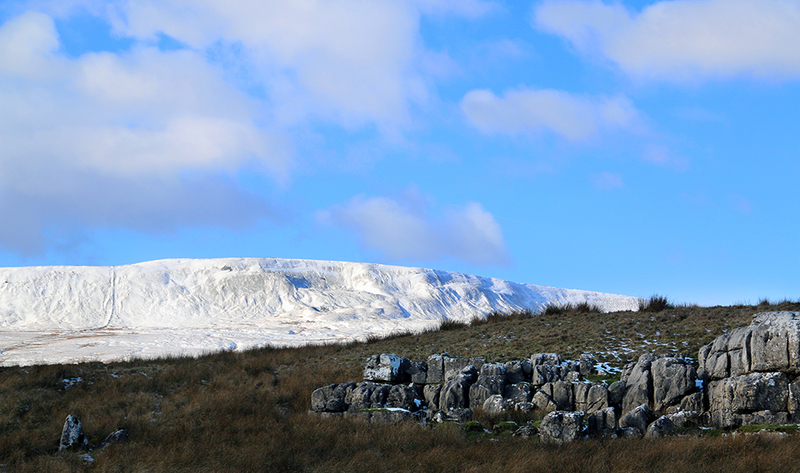 A day of contrasts: blue sky above a snowy Whernside. 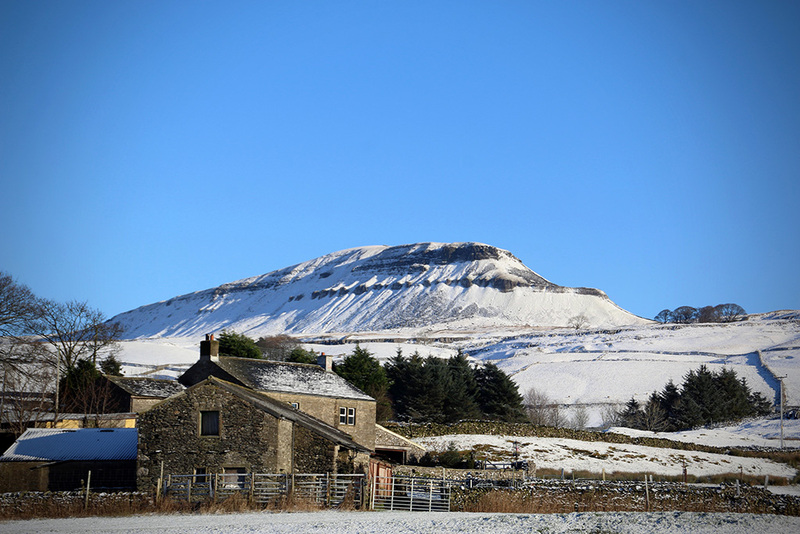 Two shots showing the third of the Three Peaks: Penyghent looking majestic. 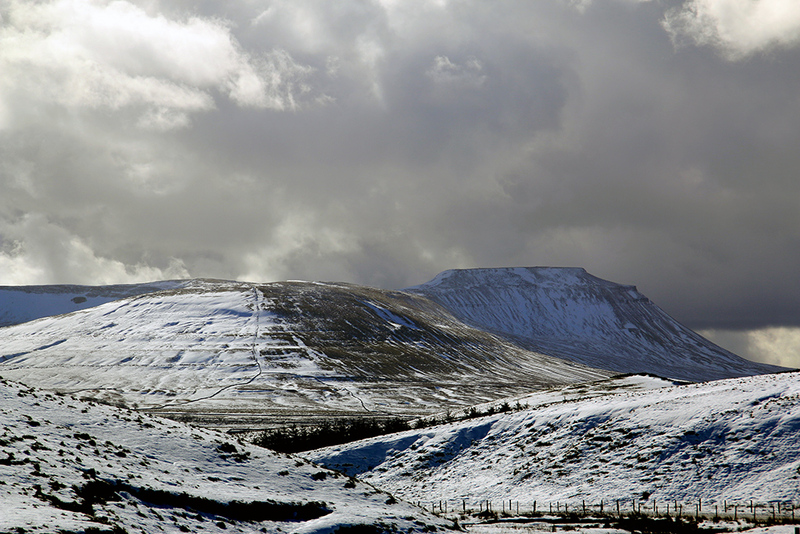 Park Fell and Ingleborough, not to be taken lightly on days like this. 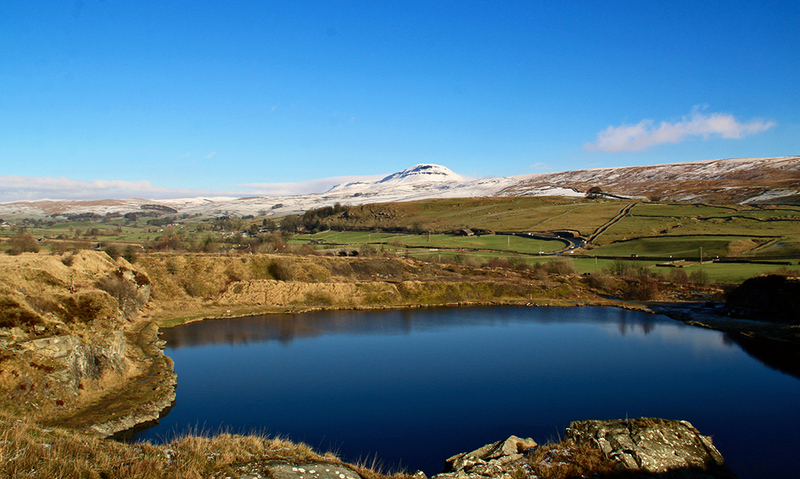 In and around Langcliffe, Ribblesdale. 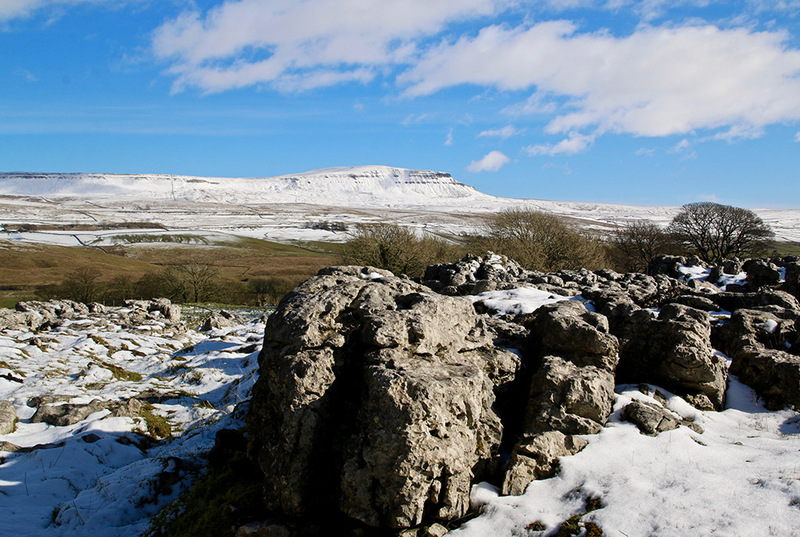 One of my favourite views, Ingleborough and Ribblesdale seen from Winskill Stones. 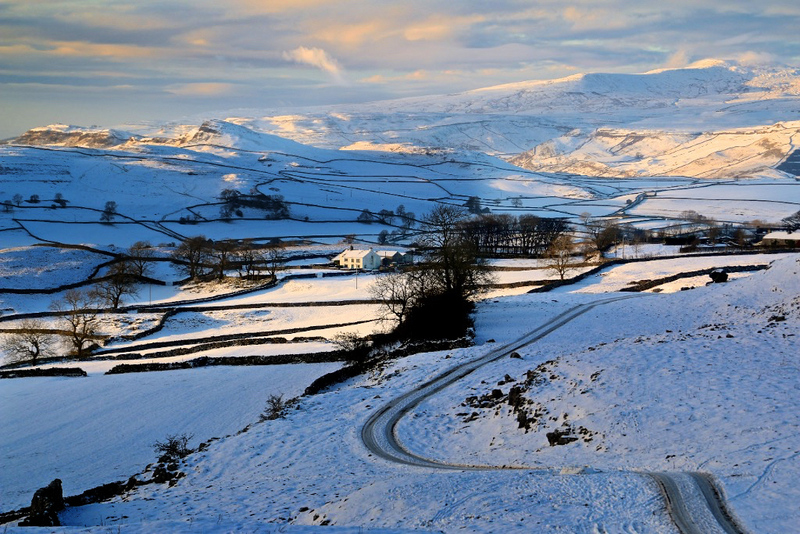 A couple of hand-held night shots from Settle (above) and Langcliffe. 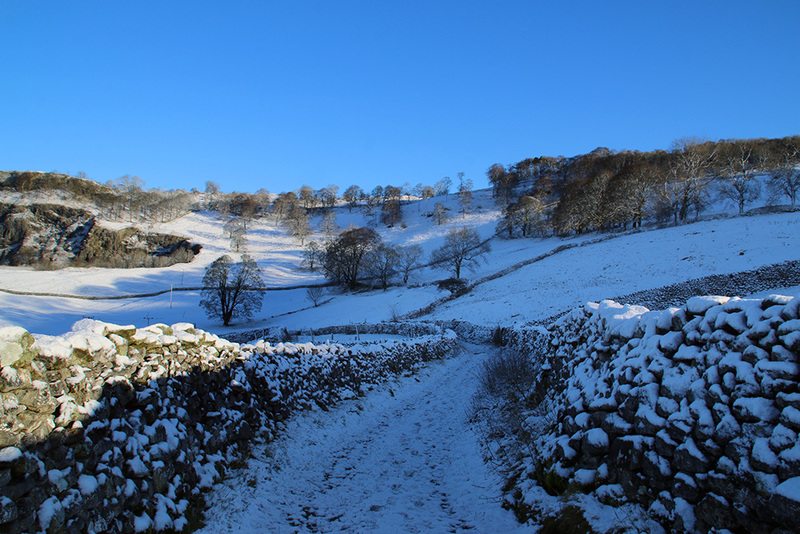 As you drive out of Settle over the top of Buckhaw Brow, just after the old road veers off towards Feizor, there’s a pull-in on the right. I remember many years ago tramping through the small wood here with friends who said there was good climbing to be found. I’m not the climbing sort and didn’t partake other than a bit of line holding. 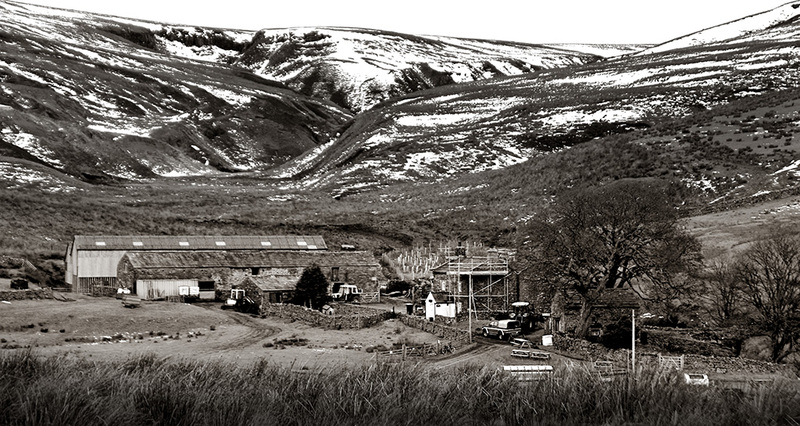 I can’t remember if climbing was allowed there at the time – perhaps I was also the lookout for approaching landowners. Anyway, despite passing this place hundreds of times over the years, this week I took a little saunter through that wood for the first time since those carefree days. 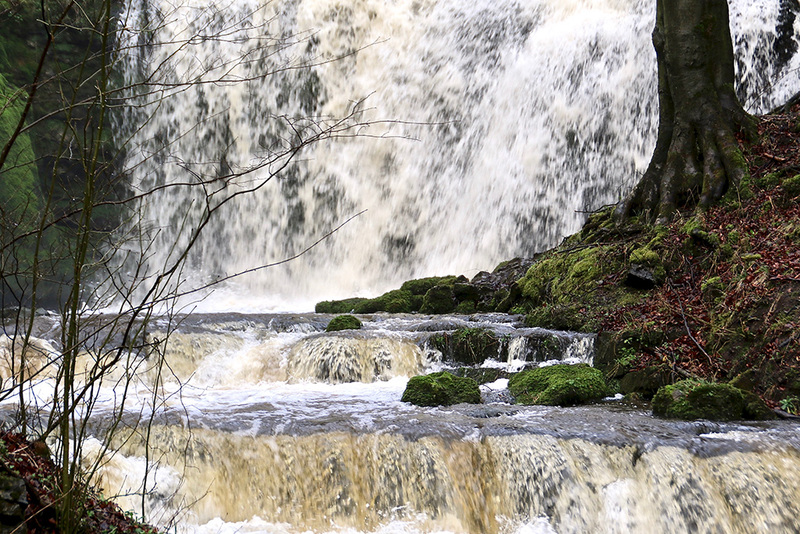 It’s a tricky place to walk but there are surprises along the way. 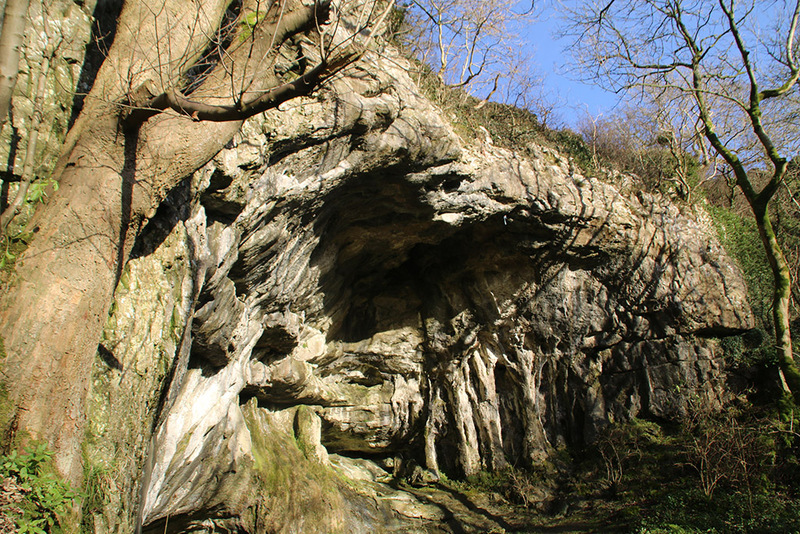 The caves are well documented (do a search for ‘caves Buckhaw Brow’) for those who like that kind of thing. I also saw many signs that climbing still takes place here. If you look closely on this photo you can make out hooks on the overhang. 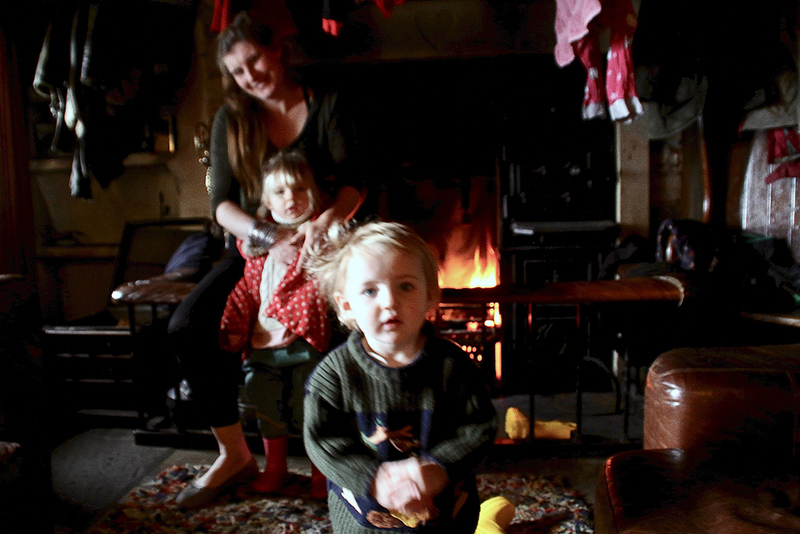 Banks are closing down at a rapid rate throughout the Dales- yet another blow for rural communities around the country. 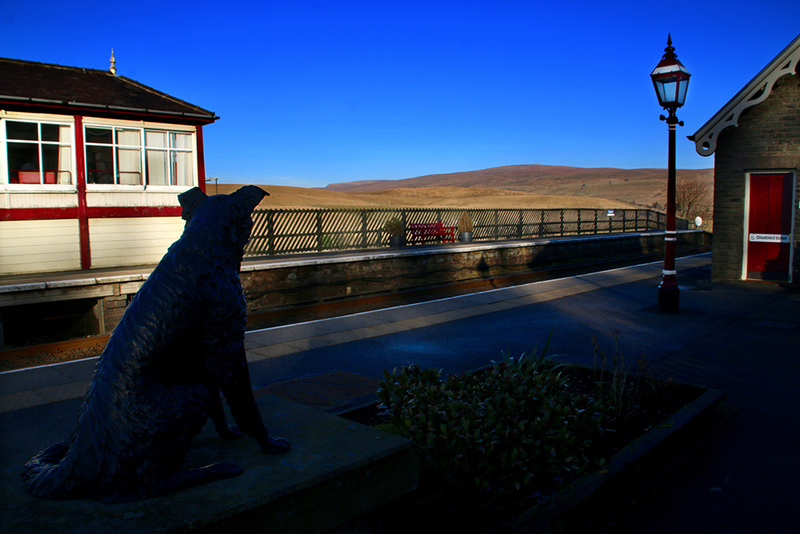 Still, it’s not a new thing … this one in Dent, which I photographed on Monday, closed in 1972! 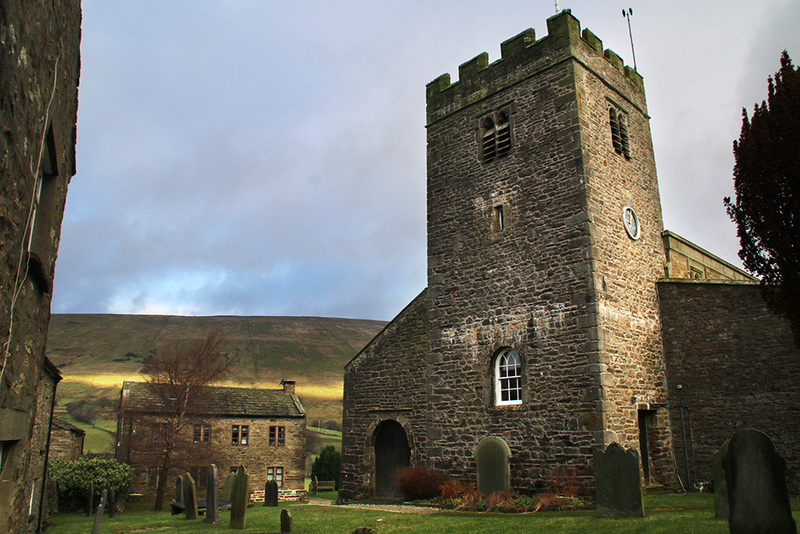 St Andrew’s, Dent, dates back to the 12th century, was rebuilt in 1417, restored in 1590, and again in 1787. A further restoration was carried out in 1889–90. 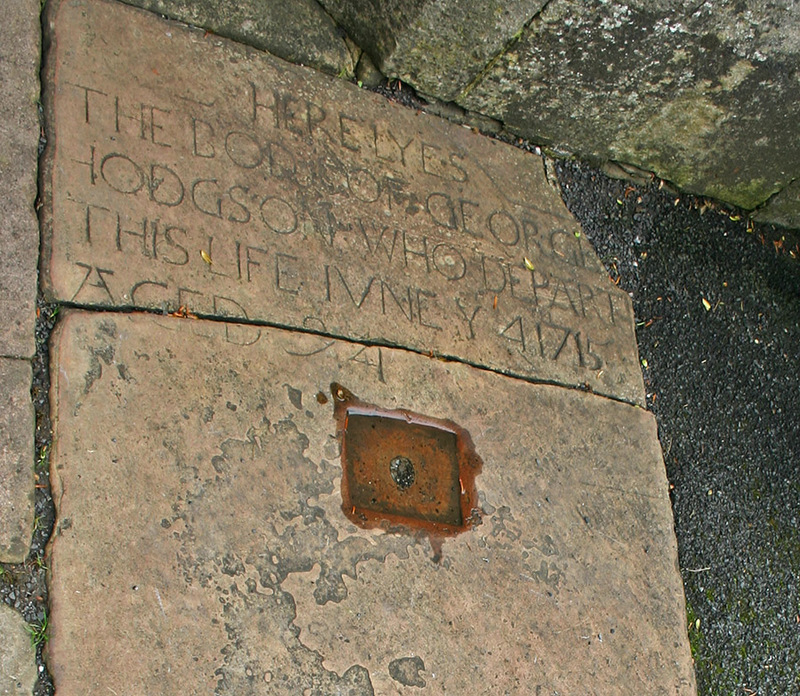 There’s a gravestone by the church porch which is said to be the final resting place George Hodgson who died in 1715, aged 94. 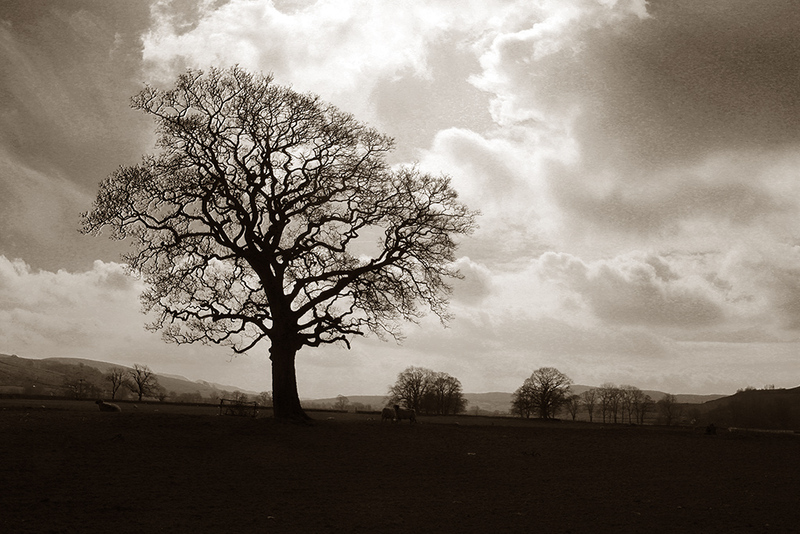 Local legend has that if you saw George’s ghost around the churchyard in the moonlight then you would quickly die. Dent’s God-fearing folk decided he was probably a vampire and that his body should be exhumed from its original grave and placed by the church door. It is said that on exhuming his body, George’s hair and nails had grown and his skin was a glowing pink. Just to make sure he was dead a stake was thrust through his heart. His ‘new’ gravestone appears to have a hole in it, in case an extra stake is ever needed. Those misery guts who like to pour cold water over such fanciful tales say the gravestone is a gatepost that has been reused, and the hole is simply part of the mechanism. I say let’s dig up the old beggar and ask him. I couldn’t go to Dent and not take a photo of the Adam Sedgwick memorial – especially when there are no cars or people around. 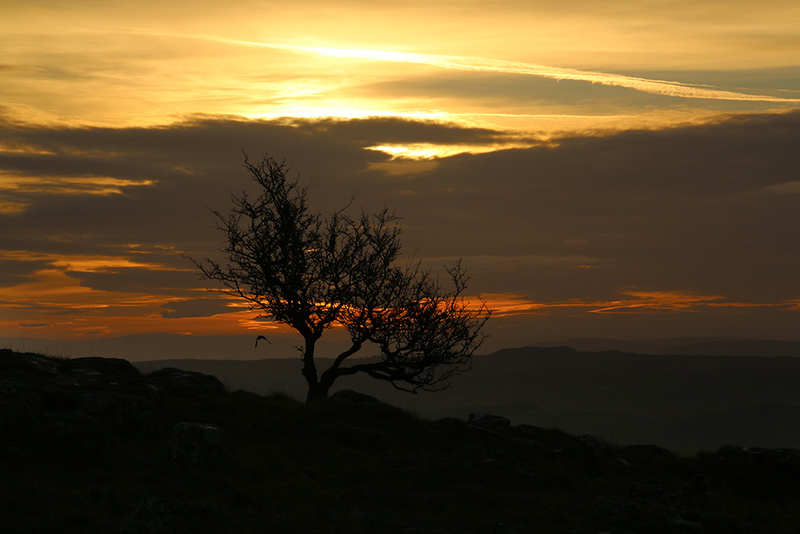 One pleasant Dales sunset this week; I didn’t know the bird was on the photo until after downloading. 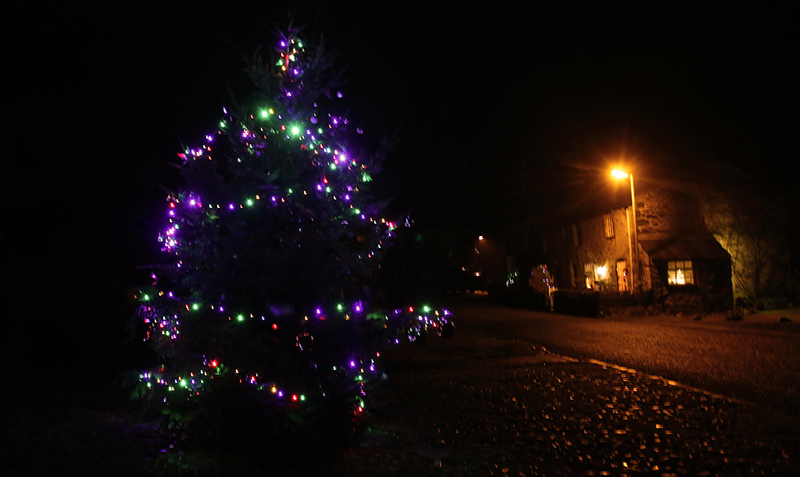 I was reminded of brass monkeys yesterday when I saw Langcliffe’s festive tree during the freezing temperatures. Funny how we take everyday things for granted. 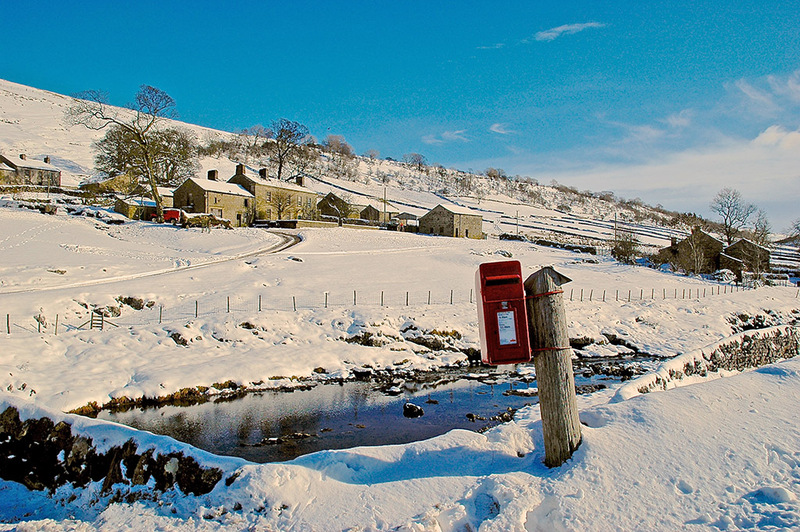 Postboxes for example. 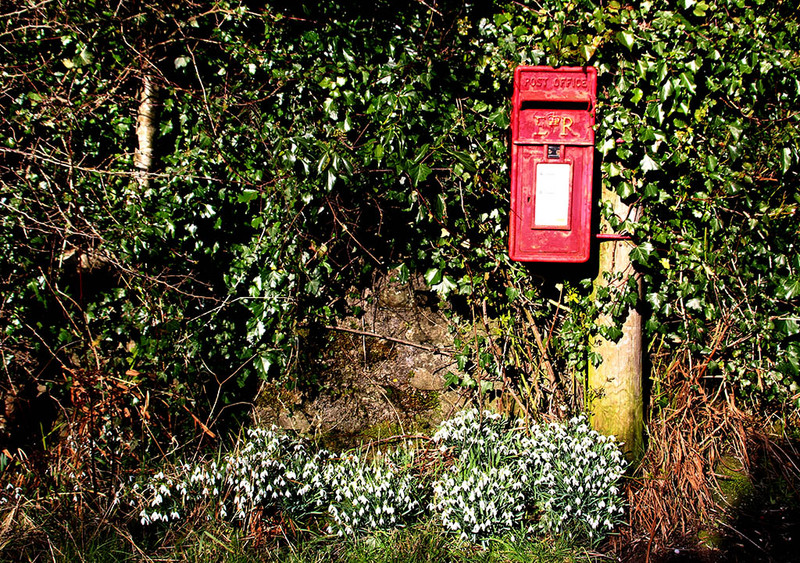 On my regular Ribblesdale stroll this week I noticed snowdrops growing by a postbox — and have to admit that until I’d seen both snowdrops and postbox together I’d not taken much notice of that bright red metal thing. 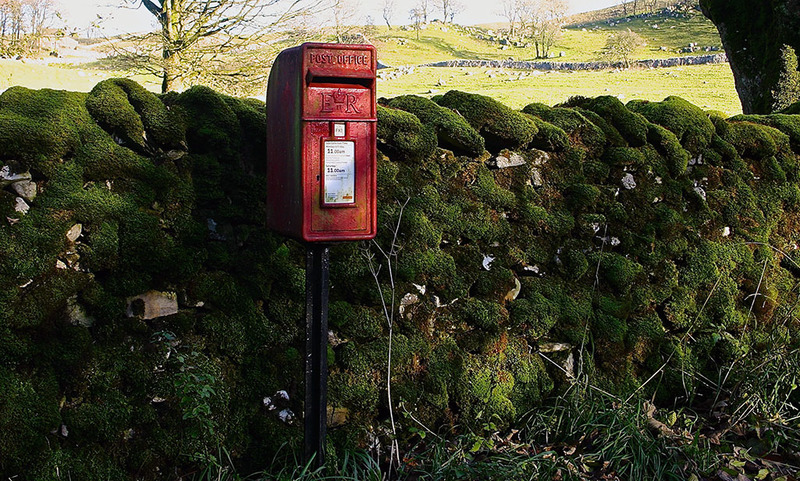 It got me thinking about other postboxes around the Dales. 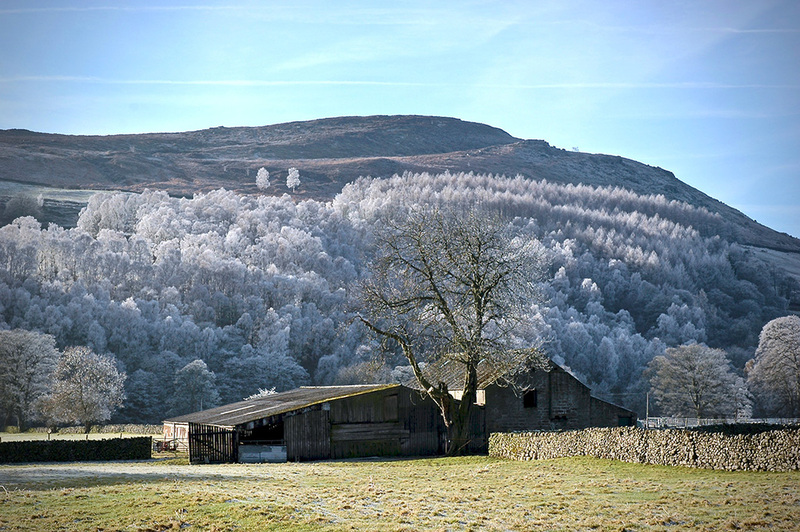 I hunted through my photo archive for some more examples … and found these in Chapel-le-dale, Langstrothdale (above) and Mallerstang. 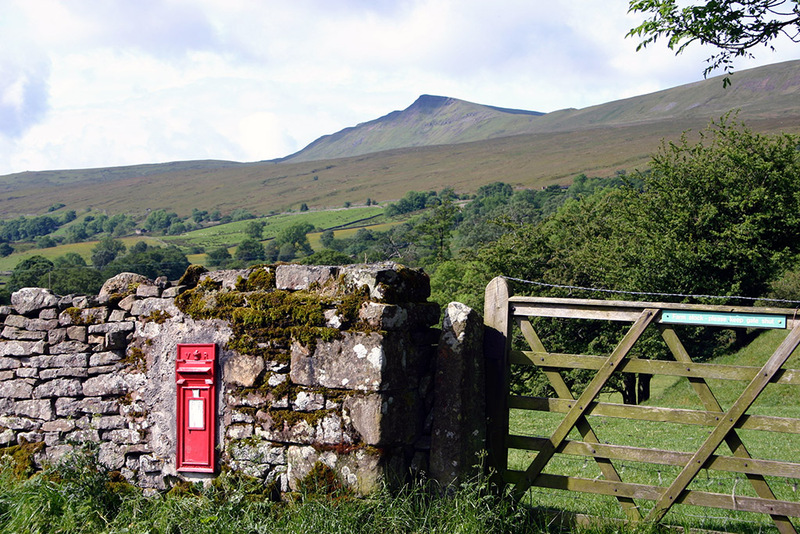 If you know of any postboxes in picturesque Dales locations let me know – I might do a bit of ‘collecting’ myself. Apparently there is such a thing as the Letter Box Study Group www.lbsg.org with a website and more than 600 members. I shan’t be joining, but surely taking photos of postboxes is more acceptable than searching the country to capture gas holders? I read this week about one chap who has this as a hobby. His pastime came to the notice of the newspapers when it was decided that the famous gas holder beside the Oval cricket ground in London (yes, non-cricket fans, it really is famous) is to be saved from demolition because it is seen as some kind of icon. Historic England adds: ‘…but our other beautiful gas holders are going’ [to be demolished]. Beautiful? Come on! 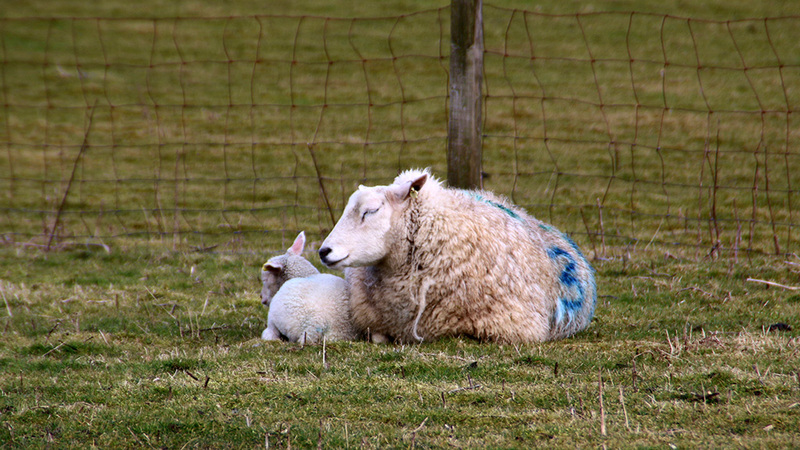 Seems it is acceptable to churn up hundreds of miles of priceless countryside for the pointless HS2 railway, and to allow our green and pleasant land to be fracked up to kingdom come, but not to knock down a rusting, useless gas holder? It’s a mad, mad world. 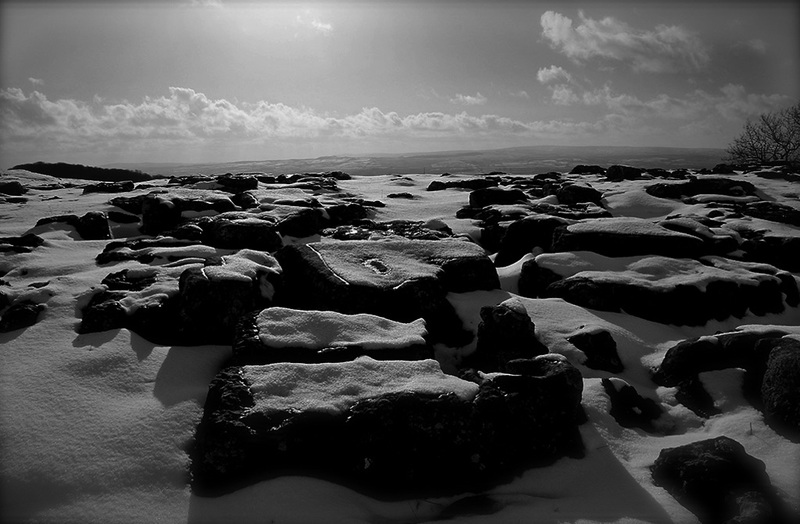 Took my first sunset shots of the year last Sunday up on Winskill Stones in Ribblesdale. 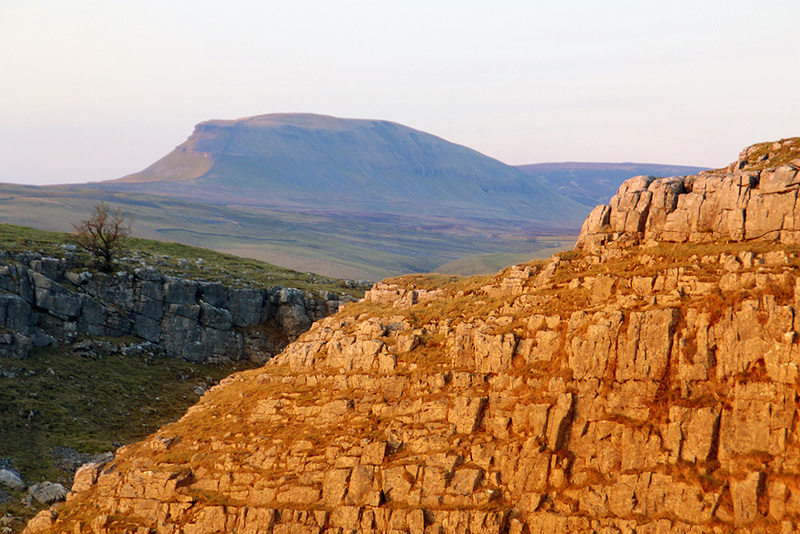 The late evening sunshine lit up the limestone and also the distant western side of Penyghent. 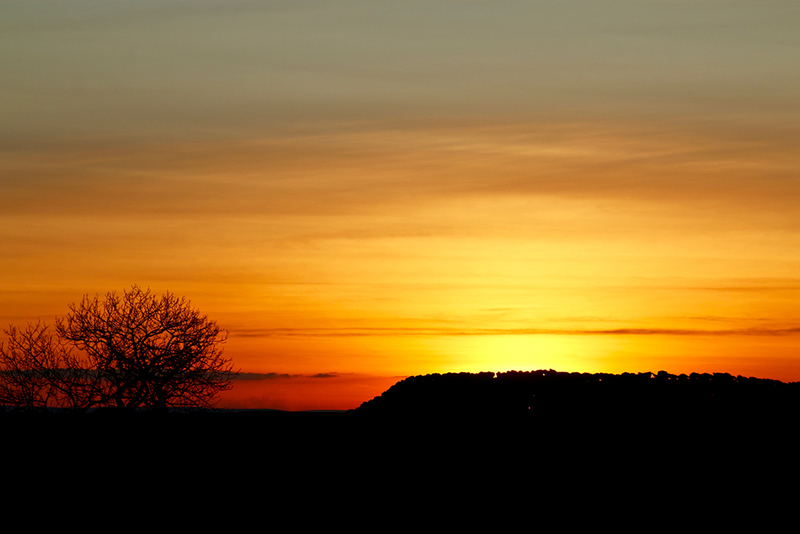 The last few minutes before the sun disappeared over Lancashire provided some startlingly vivid colours. 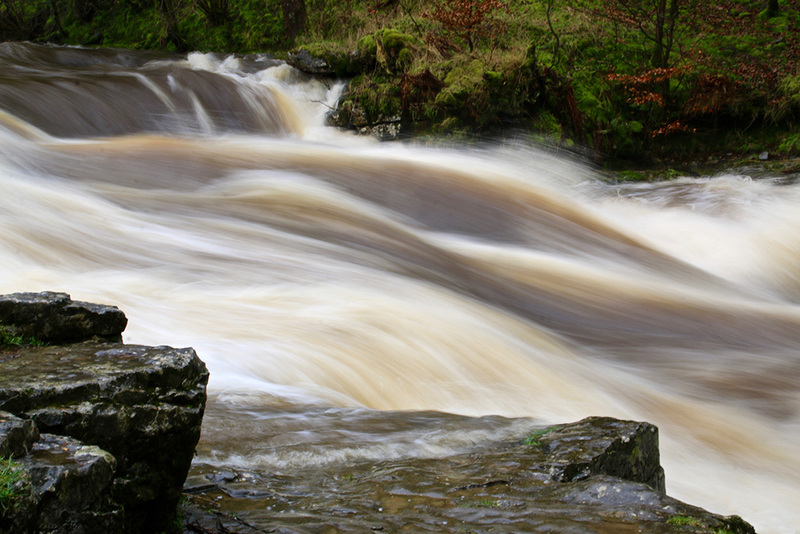 The following time-lapse shots are a bit arty-farty for me, I know, but I display them only to show the speed of the water at Stainforth Foss on Tuesday following heavy overnight and morning rain in Ribblesdale. 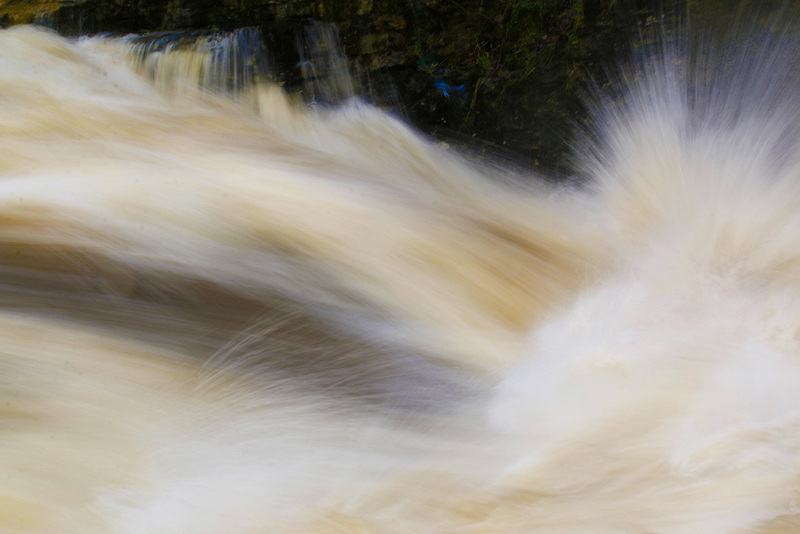 The shutter speed is set at just one-fifth of a second which tells you much about the volume and speed of the water passing in front of my camera lens. If you’d like to join me for a couple of minutes at the popular spot you can see a video here https://youtu.be/Agba6D6Txvg Excuse the quality — it’s taken on my normal camera not a video camera, and I was being buffeted by a strong wind. After the rain came Wednesday’s snow. 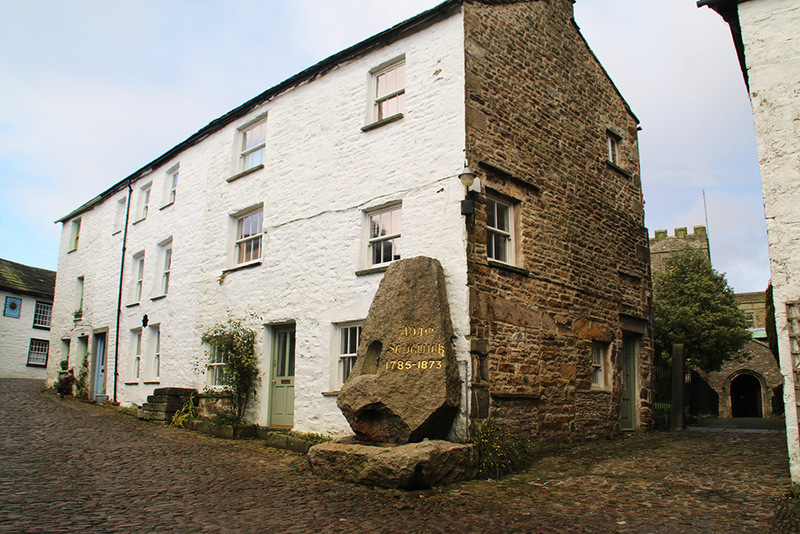 The village (Langcliffe) took on a different persona — cosier, somehow. 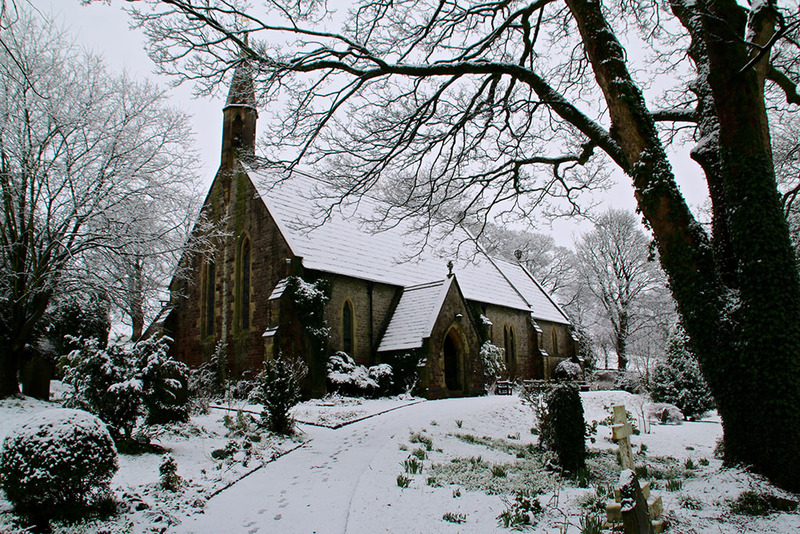 The photo of St John’s church (above) looks like a black-and-white, but it isn’t. 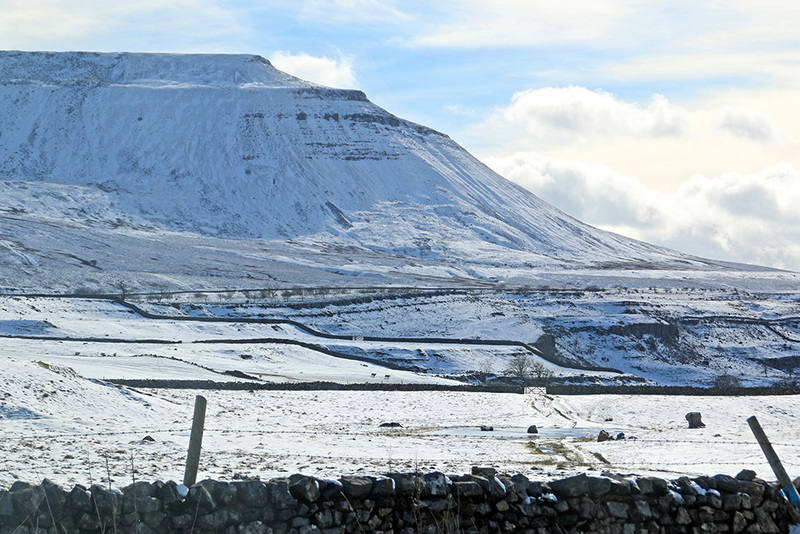 And despite seeing them a thousand times before, I just had to take a trip further up Ribblesdale to see how the Three Peaks were looking in the snow – and they didn’t disappoint. This week I’ve had to endure one of life’s greatest hardships. It’s not been easy for me, especially living on my own. Having no kids or partner around to help out has been a total nightmare. Yes, the TV remote broke. Getting up to manually change channels or just to turn the damn thing on and off has left me exhausted and frustrated. 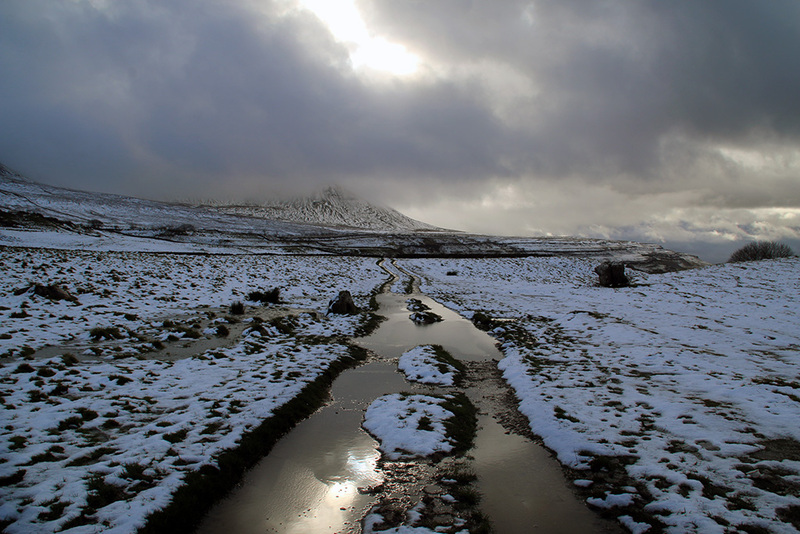 Must be the batteries (the remote’s, not mine) I thought, so off I trotted in the snow in search of power. Alas, new batteries didn’t solve the problem. So, another trip to town for a replacement zapper — no one had anything suitable for my TV. Amazon it was then. Three days delivery they said. Aargh! Just how did folk manage before remote controllers? 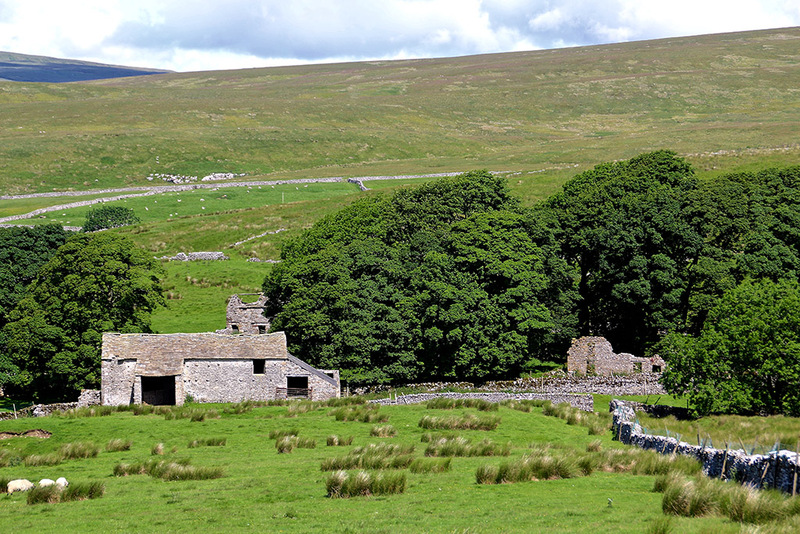 Regular readers will know of my fondness for the deserted Ribblesdale hamlet of Thorns (pictured above), just a mile or so from Ribblehead Viaduct. 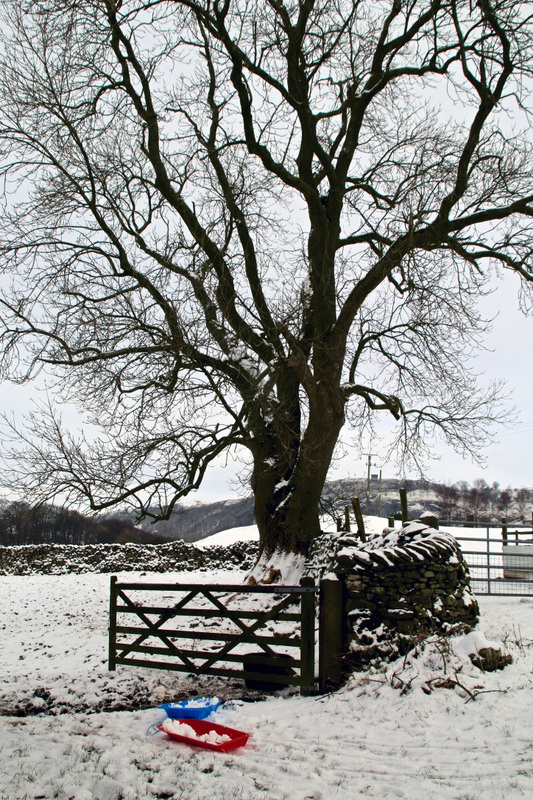 Thorns was an important location on a former packhorse route. 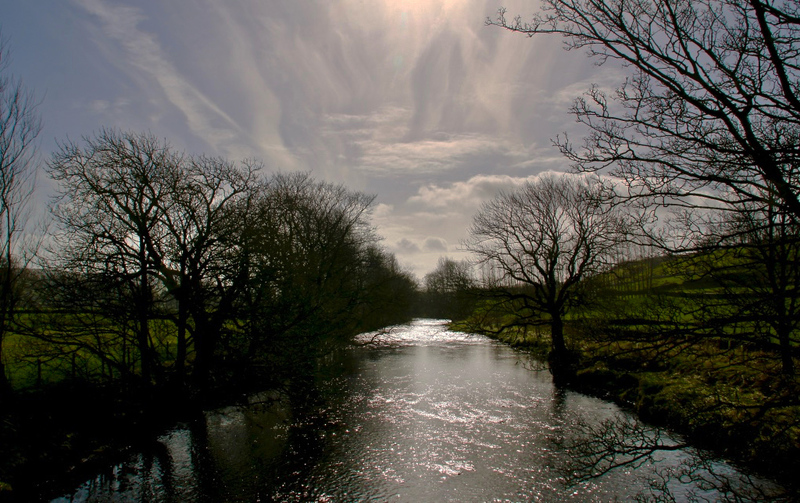 Records of the settlement I often visit for quiet contemplation, date back to 1190, when it belonged to Furness Abbey. 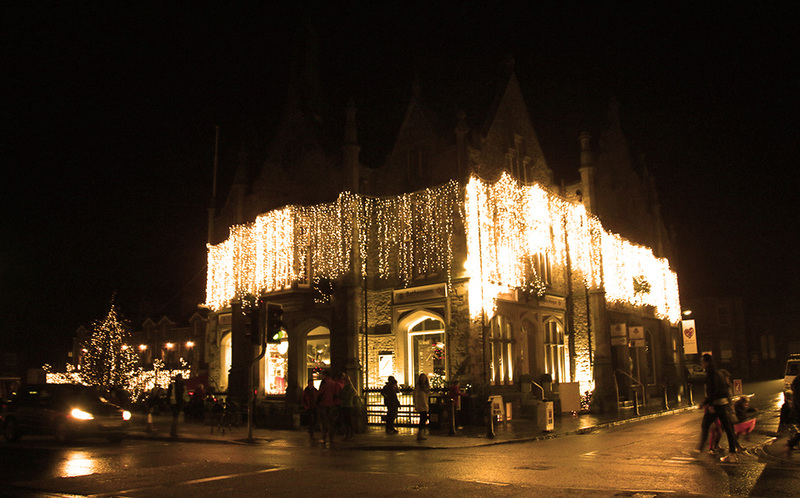 Wills, parish records and censuses indicate that there were five tenements in 1538, three households in 1841, and one uninhabited dwelling in 1891. 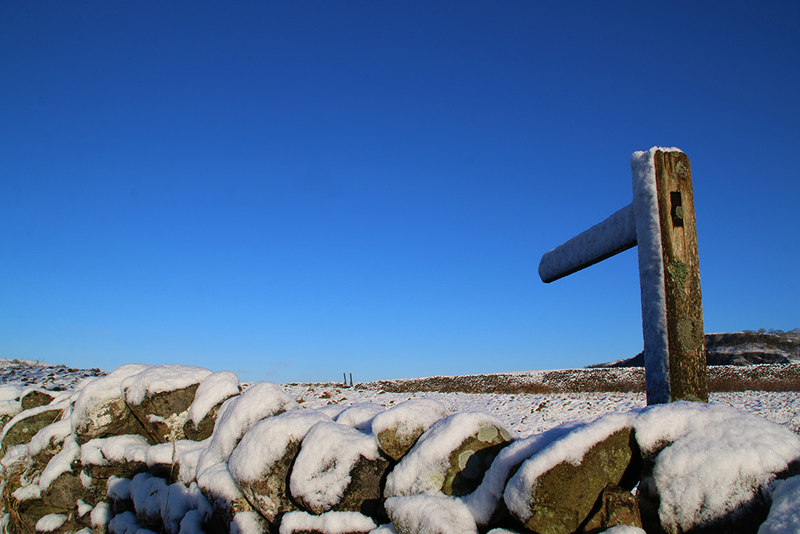 Those stats are courtesy of the charity Yorkshire Dales Millennium Trust (YDMT) which this week announced it was looking for budding archaeologists to take part in an archaeological survey of Thorns. Visit the website www.ydmt.org for more information. Yesterday was my birthday. It’s the 63rd time this as occurred so I’m used to birthdays and I don’t take much notice of them now. However, I must admit I was a bit taken aback when I read that a birthday flypast tribute by the Red Arrows had been arranged. How pleasing too that my big day was also the 80th birthday of the Spitfire and I could share my special display with that great invention. 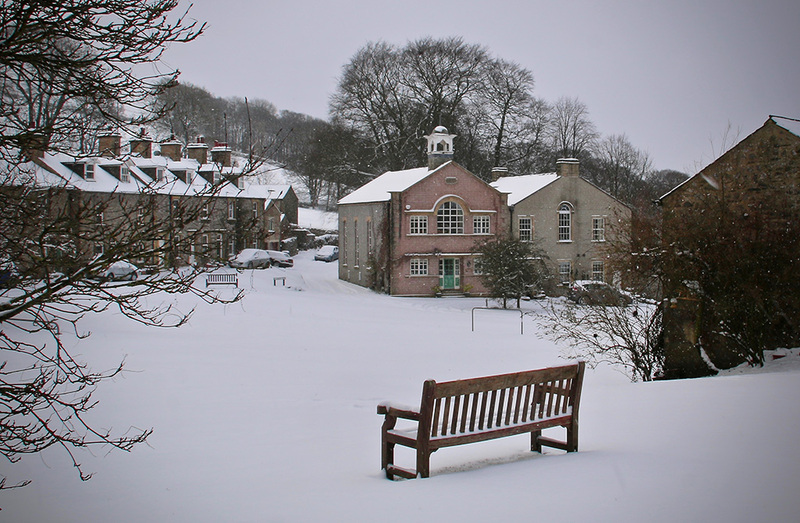 The village school closed back in 2007. 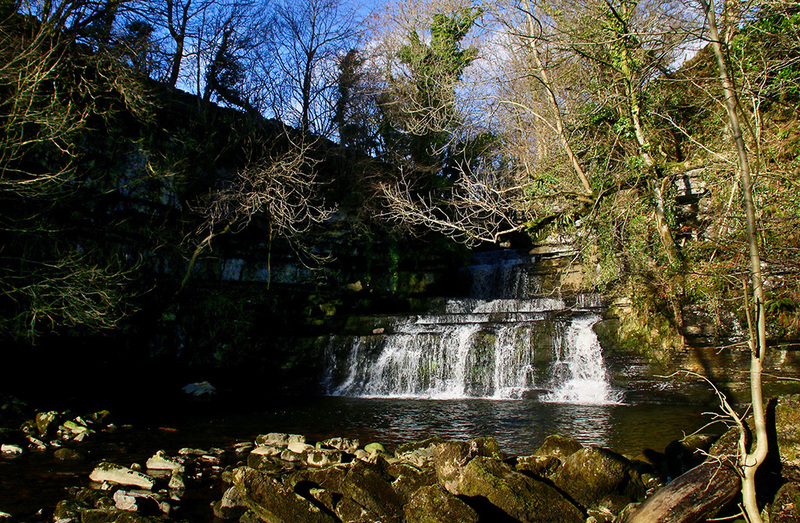 It was sold six years later for £230,000 and remains unoccupied, the new owners’ plans being refused permission by the National Park. I’ve often wondered who pocketed the money and what was done with it. What I do know for certain is that some accountant somewhere declared that the school as an education establishment was ‘economically unviable’ and shut it down. Its closure certainly wouldn’t have been decided by locals or teaching staff. 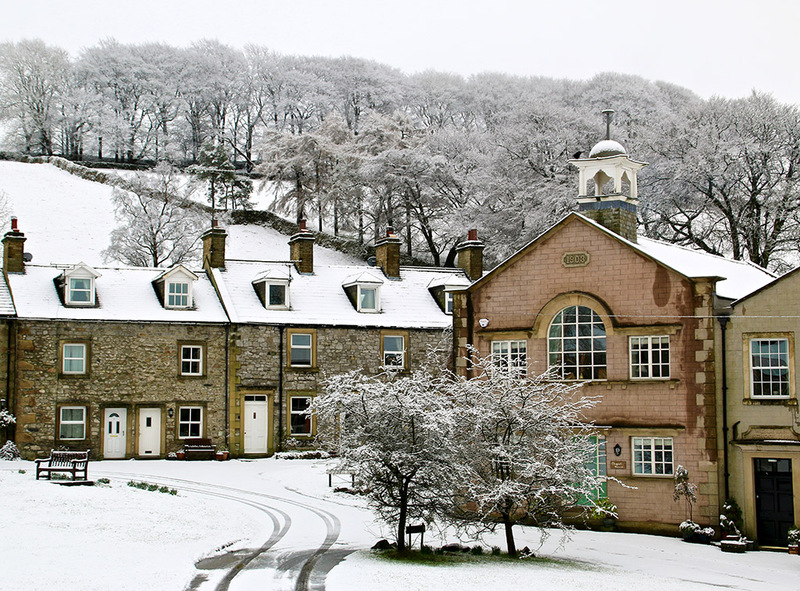 Village schools help keep dales communities together – but that’s not something an accountant working on behalf of government can quantify in monetary terms so it is ignored. I know a lot of teachers – or more precisely ex-teachers (many of them jumping ship as soon as their pensions would allow them to do so) – and I’m probably more sympathetic to the plight of teachers and how the education system is being run than a lot of the general public. I attended teacher training college before finding an opening in journalism and I was married to a teacher for many years. So I’ve kept an eye on education matters – as we all should, really … after all, this is the country’s and our children’s/grandchildren’s future we’re talking about. The problems and solutions are far too numerous and complex for me to go into in depth here. But I will say that I wish politicians would just leave alone something about which they know and understand very little. Many of them attended expensive private schools which bear no co-relation with the education of the masses. Most have no idea about the everyday life of teaching a class or running a school, yet ministers (and accountants) decide the rules and regulations by which our children are educated. I have the feeling that government would prefer if teachers just brainwashed children so that they don’t have any individual thoughts, or think creatively or question their elders. 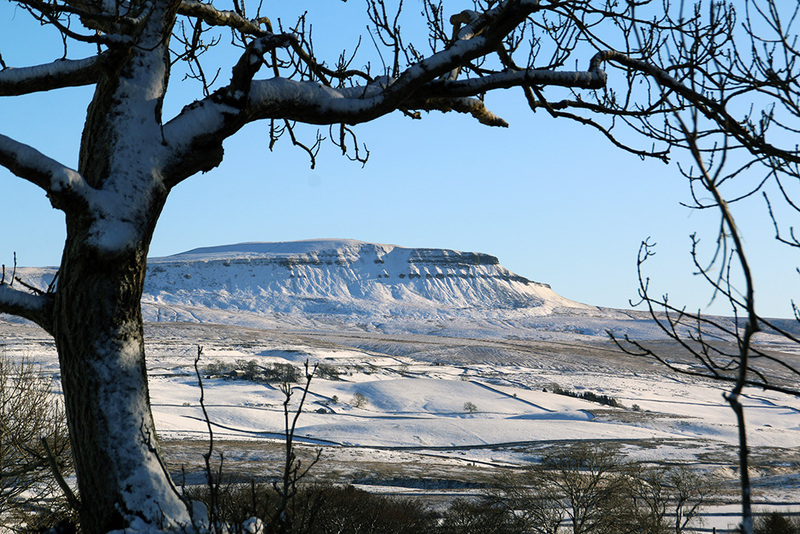 The unmistakeable outline of Ingleborough greets those motorists driving from Hawes towards Ingleton near Ribblehead. 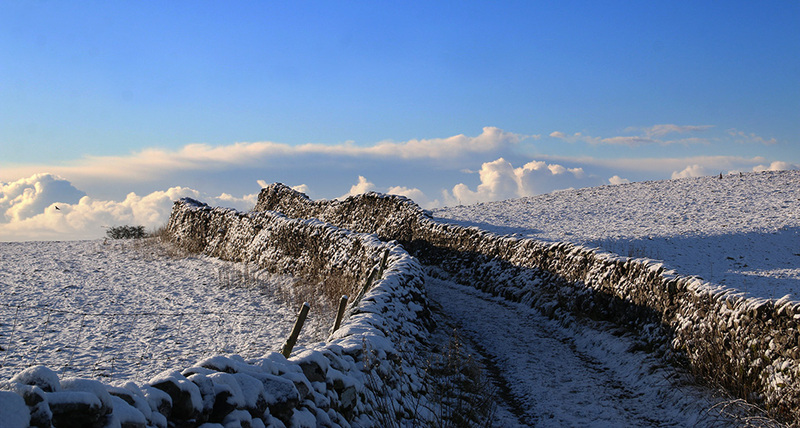 This afternoon the sun was getting low in the west; there was icy blue sky to the east, while snow clouds were building up all around me. 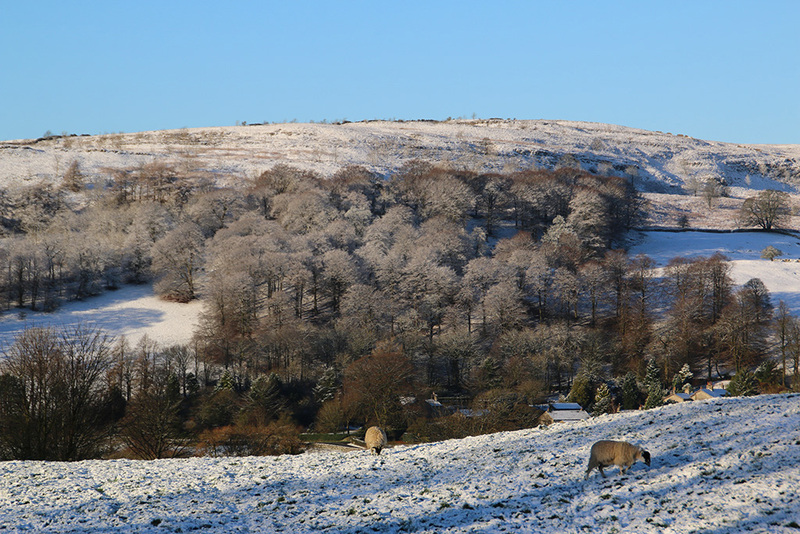 There’ll be much more of the white stuff here by the morning.